Glasser: I’m Susan Glasser, and welcome back to The Global POLITICO. 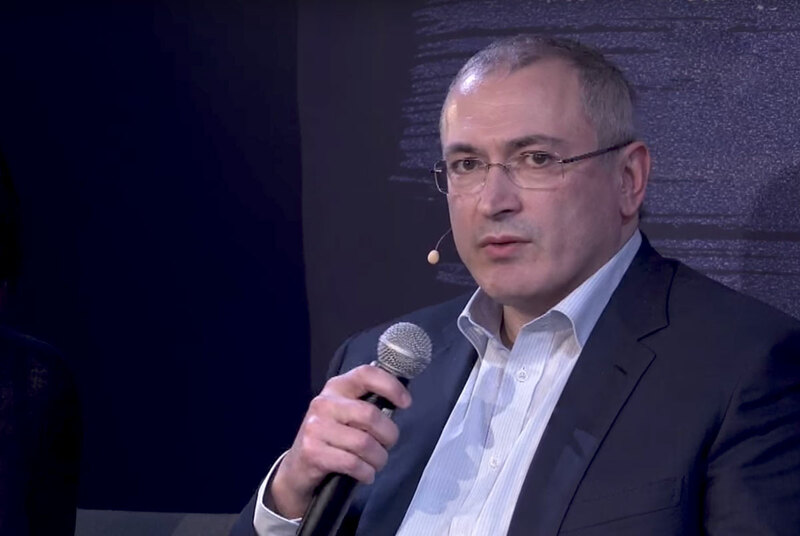 I am really delighted to have as our guest for this week Mikhail Khodorkovsky, who I think it’s fair to say has become in recent years one of Russia’s leading dissidents. He at one time, of course, was Russia’s wealthiest man. He spent a full decade, more or less, in prison, under President Vladimir Putin. He lives now in London, and he’s joining us in Washington, where he has come to a city very much in the throes of a Russia obsession, I would say these days. So, I’m looking forward to talking about all of these subjects today with Mikhail Khodorkovsky. Thank you so much. So, of course, I’ve known Khodorkovsky, I think, since very soon after I arrived in Moscow. At the time, you were still running Yukos. I never imagined that you would become a dissident, certainly. What does it mean to be a dissident in a Russian context today? Are you able—are others able, like you, to oppose President Putin inside Russia? Or like you, do you have to do this work outside of Russia only? Khodorkovsky: Can you do this kind of work inside Russia today? Yes, you can. There are quite a few courageous people who are doing this inside Russia. For reasons that I don’t quite fully understand yet, Putin regards me as the most dangerous person, and when they were releasing me from jail, the only condition was that I leave the country. And when they did push me out of the country, to make sure that I wouldn’t come back, they opened up a criminal case against me—a new one. Glasser: So, tell me about Putin in 2018. He’s just now become the longest-serving leader of Russia since Joseph Stalin. He faces re-election next year. Most people believe that even though he hasn’t declared, he will not only run again, but win another six-year term. How long would Putin be in power, and what changes do you foresee as he seeks to go about this re-election next year? Khodorkovsky: Putin doesn’t conduct elections in the Western sense of elections. This is more accurately probably described as a plebiscite, where people are supposed to express their support for him. The Russian system is not unique in this respect, but it is rather interesting. Here, in the West, the impression that people have is that Putin runs the whole country. This is not so, at all. To a certain extent, you could say that he runs the Kremlin, and this means that it’s, in some situations, hard to tell whether it’s him running the Kremlin, or the people around him running him. But one thing is for sure, though, that [Putin] certainly does not run Russia outside the inner beltway of Moscow. The pact that he has with those people who actually do run the various regions of the country is a rather simple one: you bring out the level of vote that I need for my purposes, and I let you do what you want to do in your region. That’s how it works, and that’s how it’s going to work in these upcoming elections. But of course, people expect some kinds of decisions from Putin that will help them see their own future. A significant part of the people that he relies on are quite content with him telling them that nothing is going to change. But that part of the elite that does want to see some changes and improvements are going to expect him to, in his next term, bring Russia back into the club of the great powers. Is he going to be able to do this without making any serious changes inside the country? I have very strong doubts about that. Is he prepared for major changes in the country? I have serious doubts about that. Glasser: So, why do you think we here in the West, and in Washington in particular, get Putin so wrong? We’ve built him up into this huge figure, both in Russia, and now in our own politics. Khodorkovsky: Part of the people here are interested in the same thing that Putin is interested in: Putin wants to have America as an enemy. Part of Americans want to have Russia as an enemy. It’s advantageous. The other part of the people are just ordinary people. And these people project onto big objects the kind of relations that they have with small objects in their everyday lives. I am working in my office. I’ve got a boss who tells me what to do. He’s got a boss who tells him what to do. And above him is another boss who probably is telling my boss in the same way—or my boss’ boss in the same way what to do. In actuality, this is not the way things work. Management science says that that kind of a chain doesn’t work more than three levels up. But who knows that? And that’s why people so easily accept this myth about this great and horrible Putin. Glasser: So, what are the consequences of that, and what do you think of our new nachalnik, Donald Trump? Khodorkovsky: The consequences, unfortunately, are quite sad. People take the lazy way out, and do not regard Putin and the Kremlin as the real enemy. They create a long but erroneous chain in their heads. Putin is the leader of Russia. Putin does X, therefore Russia is doing X, and Russia is our enemy. And so, we introduce sanctions, for example, against Russia. This is a very bad oversimplification, because in the modern world, you can’t punish a big country. Even when you’re just saying that you’re punishing a big country. This leads to results that are the opposite of what you’re hoping to achieve, because people perceiving you as the aggressor start rallying around this person who’s the last person that they would ordinarily be gathering around. And a people who think that their problems exist because they’re under attack are able to, and prepared to, tolerate these problems way more than they would if they were aware that their problems are the fault of their own leadership. Glasser: Well, it’s interesting. You made this point—I’ve heard you make this point that, in fact, Vladimir Putin is very familiar with this psychology, and that he basically creates problems in order to then solve them—creates conflicts in order to have this happen. Khodorkovsky: Yes, Putin does do this, but we’re talking about something different here. What I was just saying is that by equating Putin and Russia, you are creating a situation that’s the opposite of what you would like to have happen. Glasser: So, no sanctions if he invades Crimea? That was a mistake? That decision that Congress took was a step in the right direction. Glasser: You mean the Magnitsky Act? Khodorkovsky: It’s the Magnitsky Act, and it’s also this recent decision to identify these people by name, and to take measures—individual measures against them. But a second very important element is half-baked in all this. And that is explaining to Russian society that your actions, in this case, are among other things, for the benefit of Russian society, because Russian society really doesn’t like it when it gets its money stolen. Russian people really don’t like it when somebody does all these horrible things in Russia, and then can calmly go travel to another country and spend time there. And this is what needs to be done: the Russian people need to be told this, because in today’s world, just doing something is not enough. You’ve got to tell about it, too. If you’ve done something and haven’t told about it, it’s as good as if you hadn’t done it at all. Glasser: Do you foresee President Putin going into any other foreign adventures, shall we say? Will there be more Ukraines and more Crimeas, more Syrias in the future? Khodorkovsky: That’s impossible to predict. Putin has an obvious problem. His country’s economy is in stagnation. He needs to constantly be pointing a figure at who is at fault. America is at fault. He needs to show those fronts—those directions in which he is defeating America. In Syria, for example, in Syria, he is defeating America; not ISIS, he’s defeating America. In Ukraine, he’s not defeating Ukrainians; he’s defeating Americans in Ukraine. Will he need some other place where he needs to show that he’s defeating America? I don’t know. Maybe. Glasser: So, what about defeating Putin? What is the state, in your view, of the opposition inside Russia today? 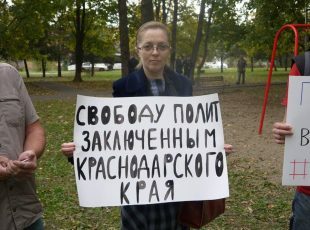 Khodorkovsky: It’s not easy for the opposition. The authorities are doing quite a good job at controlling Russian society. Given that Russian society is not all that young, people prepared to put up a resistance aren’t great in number. But that apathy that we saw two years ago after the Crimean adventure, it’s passing. And so, now things that are important are, for example, the upcoming elections. It’s important that society demonstrate that it is not pretending that these elections are elections. There are going to be municipal elections at the same time. Well, the same year, in 2018. And here, just the opposite; the people need to show that they are prepared to run their own lives, and are ready to vote that way, and this is possible because Putin cannot control every municipal election that takes place in the country. Glasser: What is your assessment of Alexei Navalny? Does he have the possibility to become someone who unites the opposition inside the country? Khodorkovsky: It’s a very erroneous strategy to try to push the Russian opposition to unite at this stage of the game. First of all, the opposition is addressing different parts of Russian society that have differing points of view. And besides, a united opposition is a nice big target that the authorities have a much easier time fighting. And besides, resisting an authoritarian regime with an authoritarian opposition merely means that, in the event of victory, you’re just doing yet another round of the same old, same old. So, Navalny is doing a very important thing in his segment of society. Gudkov is a doing a very important thing in his segment of society. 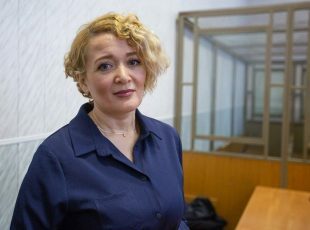 Yabloko, or more accurately, some of the leaders of the Yabloko party, are doing a very important job in their segment of the population, people such as Schlosberg. And our organization Open Russia is also doing important work with its segment of society, because those people who are focused on us, our segment, they’re not part of those other segments. This creates the opportunity, subsequently, if and when a real opportunity to take power exists, or maybe at a local level some place, for us to unite and work on resolving problems together. But certainly, the thing not to do is to offer Russian society, as an alternative to an authoritarian Putin, somebody equally authoritarian. We’ve already had that experience in Russia with Boris Yeltsin. Glasser: Are you saying that you think Navalny has some authoritarian tendencies? Khodorkovsky: Every politician deep inside is authoritarian. If the person doesn’t have ambition, that’s not a politician. Society needs to put every ambitious, every effective politician into such a position that it helps—that this person helps improve society. That’s why I’m always talking about need to change the system rather than should we go with Navalny or Gudkov or Yavlinsky or Khodorkovsky. We all have our ambitions. We’re all ambitious people. Glasser: So, it’s 100 years anniversary of the Bolshevik revolution. There’s a conventional wisdom that change in Russia only happens quickly and bloodily. Do you see the transition from Putin, whenever that occurs, as also following that pattern? Khodorkovsky: Actually, I’m hoping that it won’t happen that way. If we talk about changes of power in Russia, that has occurred several times in the past century. After Stalin came Khrushchev, who implemented his legacy quite radically, one could say. But there was no blood, nonetheless. After Brezhnev came Gorbachev. I’m not talking about the ones who were in power for only a short period of time. Gorbachev, too, left a very radical legacy. And then Yeltsin came. The blood that was spilled in that transition was exactly two people. So, we do, in fact, have a tradition of big changes without lots of blood. I’m hoping that we will continue this tradition. Glasser: But not necessarily next year? Khodorkovsky: Unfortunately, definitely not next year. Glasser: Tell me, are you—how concerned are you for the safety of yourself and others who are doing this opposition work right now. You’ve been in prison, Boris Nemtsov was killed, Vladimir Kara-Murza who works with you and Open Russia has been poisoned not once but twice. How dangerous is it to oppose Vladimir Putin? Khodorkovsky: It’s a profession that’s not without its dangers. But if you’ve chosen a job like that for yourself, you then subsequently shouldn’t spend your time every second thinking, oh my God, what might happen to me? Oh my God, what might happen to me? Your colleagues include quite a large number of war correspondents. Their job is not the least dangerous in the world, either. And they do it. And as far as I know, they don’t get paid all that much, either. Glasser: It’s a very specific form of work, that’s right. Being a dissident in Russia, or a war correspondent. Khodorkovsky: Exactly. In terms of danger, I think these two jobs are very comparable. Glasser: Mikhail Khodorkovsky, thank you so much for joining us. You’re in town in Washington from London today, headed off to the state department. What are you planning to tell them at the State Department? Will you let us know when you find out? 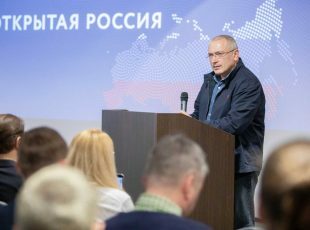 Khodorkovsky: Actually, what I’m hoping to do is to find out from those people who have now finally been approved and appointed, what their plans for Russia are. Glasser: Will you let us know when you find out? We’re still waiting. Khodorkovsky: I’m afraid that’s not going to happen this year.